Former Vice President Joe Biden, mulling a presidential run, is facing allegations of inappropriate behavior. Former Vice President Joe Biden is expected to make an announcement about a potential presidential bid this month. While the latest controversy over allegations of inappropriate touching probably won't change his decision, it may shade the views of voters. Biden is the first to tell you he's a hugger, a warm-hearted consoler and a comforter. "He's like a little puppy dog," said Edie Hallway of Boston. "He's somebody who is very affectionate, appreciative and likes people." But amid the #MeToo movement, one person's affectionate is another person's inappropriate. "Times have changed now, and we are more aware of it being inappropriate, but back then you know, that was the norm," said Barbara Medina, who was visiting Boston Monday. "I think there's definitely like a generational thing," said one woman in her 20s. "As we've kind of come of age and kind of started to notice those things, expectations have changed." "Joe Biden has done a lot for women. With the violence against women act, he promoted that, but that doesn't mean that he gets away scot-free here," said Linda Williams of the Wellesley Centers for Women. Williams says it is encouraging that women, like Lucy Flores, are feeling empowered to speak out in a way they did not just a few years ago. She says men are evolving, as well. "I believe Lucy Flores," said U.S. Sen. Edward Markey of Massachusetts. "I think she has a right to speak her truth. Flores, an elected official in Nevada, called out Biden for inappropriate, though not sexually abusive, touching. Markey says women have a right to demand respect -- though he said only Biden can decide how this controversy might affect his decision about a presidential bid. "And then it's a decision which the voters of the United States are going to have to make," Markey said. The impact of all this on the former vice president may depend on how long it stays in the news. 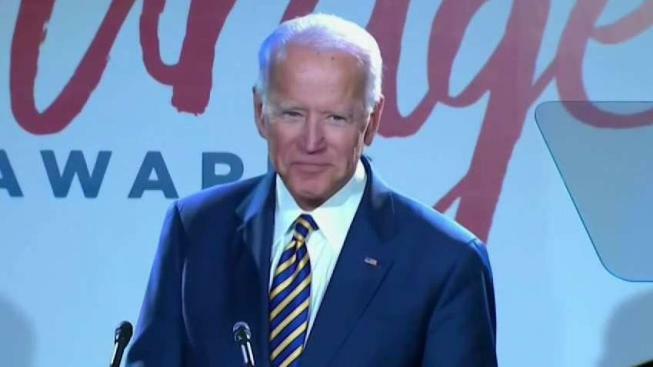 Another allegation came Monday afternoon from a Connecticut woman named Amy Lappos, who told the Hartford Courant that Biden touched her inappropriately and rubbed noses with her during a 2009 political fundraiser.